heather & olive: butternut squash risotto. One of my most favorite recipes to make when the temperature dips is Ina Garten's Butternut Squash Risotto (recipe here and also in her Family Style cookbook). It's easy, delish and it reheats well--perfect to make on a Sunday and enjoy through the week. (If you're making this for one, I recommend halving the recipe. You'll still be left with pounds of risotto-y goodness). A couple of years ago, my dear friend S. hosted a dinner party at her amazing apartment in Boston. I made this dish to rave reviews, but I also committed the cardinal sin of dinner party cooking: I spent too much time in the kitchen cooking/drinking copious amounts of wine and ultimately didn't eat enough food. Needless to say, later that evening I left my mark (quite literally) on the sidewalk of the South End and my favorite pair of boots. But a testament to the fabulousness of this recipe is that I still make it frequently--it's so good that the terrible aftermath of that fateful dinner party is (mostly) forgotten. 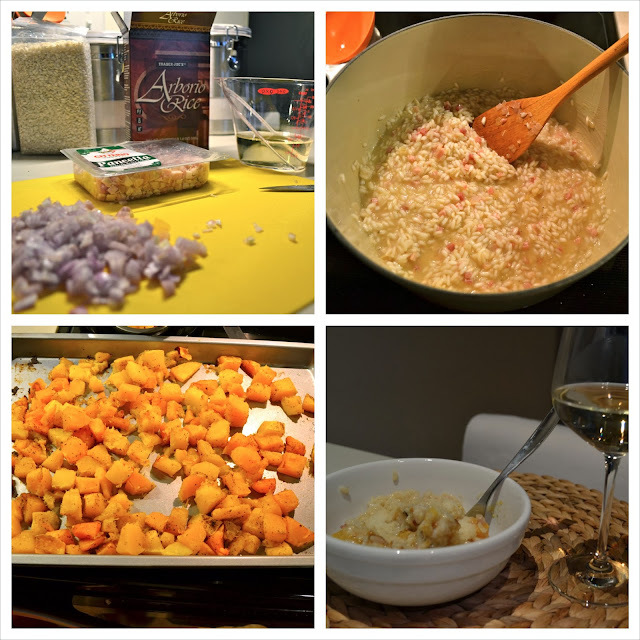 Lesson learned: Ina's Butternut Squash Risotto is delectable and a gallon of wine on an empty stomach is no bueno. I am printing this recipe out now. I am totally making it this weekend while I am in Vermont! The South End bricks in the sidewalk can be killer after too much wine. I have taken similar falls all over Boston.